There are signs that the "concealed carry" group was making headway even before the tragedy at Northern Illinois. Earlier this month the South Dakota House of Representatives voted overwhelmingly to force state universities to allow students to carry weapons on campus, according to GOP state Rep. Tom Brunner. The bill, which Brunner sponsored, recently died in the state senate, but Brunner said he intends to bring it back as soon as he can. "It's not an issue that's going to go away," Brunner said. "We feel pretty passionate [that] students and teachers should have a right to defend themselves, and weapons on campus should be a part of the plan." . . .
Those interested in joining Students for Concealed Carry on Campus can do so at facebook here. The group has a second national protest coming up from April 21 to 25th. Thanks to Rich for sending the link from Newsweek to me. While stopped at a red light at Carpenter and Packard roads a few minutes later, the victim said the driver of the van confronted him and began yelling. He said he exited his vehicle and was punched in the face and knocked to the ground, Heller said. Two women, including the woman he tried to help, got out of the van and began hitting and stomping the victim while he was on the ground, Heller said. A passing motorist stopped his car, pulled a gun and demanded the trio stop beating the man, Heller said. Police responded to several calls reporting a man holding people at gunpoint. Officers determined the man with a gun had a legitimate concealed weapons permit and was trying to help, Heller said. Officers arrested an 18-year-old Ann Arbor man and two 19-year-old women. They were released pending charges. For those interested you can listen to his discussion of her speech here. Things have gotten so much worse during her lifetime? Income has soared. Life expectancy has gone up. I agree with Hugh that this is a scary speech. Support for gun rights is an overwhelmingly Republican issue. 9 of the 55 Senators who signed the Supreme Court brief saying that gun ownership is an individual were Democrats (9 out of 51 Democrats is an 18 percent rate). 46 were Republicans (thus 46 of the 49 Republicans signed it, a 94 percent rate). 67 of the 250 Congressmen who signed the brief were Democrats (with 233 Democrats in congress that is a 29 percent rate). Again that means 183 out of 201 Republicans signed it (a 91 percent rate). This map is from GunMap.org. They should be coming out with a new map this next week. WASHINGTON — An election-year dispute over whether to allow loaded guns in national parks is holding up a vote on a massive bill affecting public lands from coast to coast. Democrats accuse Republicans of trying to score political points by injecting a "wedge" issue like gun rights into a noncontroversial bill. Republicans counter that Senate Majority Leader Harry Reid is trying to protect the two leading Democratic candidates for president by shielding them from a politically difficult vote on an issue that many rural voters consider crucial. Arizona Sen. John McCain, the leading Republican contender for president, is a co-sponsor of the amendment, which would allow gun owners to carry loaded, accessible firearms into national parks and wildlife refuges. Current regulations ban gun owners from carrying easy-to-reach firearms onto lands managed by the National Park Service and Fish and Wildlife Service. Spokesmen for the two leading Democratic presidential contenders, New York Sen. Hillary Clinton and Illinois Sen. Barack Obama, declined repeated requests to comment. The gun amendment is sponsored by Sen. Tom Coburn, R-Okla., a longtime gun-rights advocate who has endorsed McCain. A spokesman for Coburn accused Reid, D-Nev., of bad faith in refusing to allow a vote on the issue, despite an earlier agreement between the two senators. . . .
A majority of Senators have signed legislation asking that people with concealed handgun permits be able to carry their handguns with them in parks within states that recognize those permits so this bill would easily pass if a vote were allowed. I can't imagine that this type of game playing makes Senator Harry Reid a popular guy in Nevada. At his news conference, he voiced support for the District of Columbia's ban on handguns, which is scheduled to be heard by the Supreme Court next month. I have blogged on this issue before, but I would like to see someone ask Clinton and Obama in their debates about how they can reconcile their position on the gun ban with their claimed position of gun ownership as an individual right. I have other reasons to doubt Obama's claim on gun rights. Astronauts aboard the International Space Station apparently have access to a gun. Russian Cosmonauts carry a gun on their Soyuz space capsule, which is attached to the space station. . . .
"A petition shall be granted if the person meets all requirements of this section for restoration of the right to possess a firearm and the petition." Information provided to me by a mole in the Washington Senate. His check of multiple victim shooters indicates that these murderers are not religious individuals. I have never really compiled this information myself, though I seem to recall at least one case in Seattle where I thought that the killer was Islamic, but in any case, I accept his statement that it is quite rare that these killers are religious. Dennis' point was that if all these people were religious, the media would have made an issue of it. The fact that they are not religious makes it not interesting to the media. I think that he is correct on this. I also agree with his concern that it is extremely disappointing to see the murderer's death included in the victim count. I have been bothered by this for years and I am glad to see Dennis mention this. Faintings at Obama Rallies Staged? Orbusmax writes about seven clips showing women fainting at Obama rallies: "CLIPS FROM BARACK OBAMA RALLIES... EACH IS A WOMAN... EACH WOMAN STANDS DEAD CENTER, RIGHT IN FRONT OF THE STAGE WHERE OBAMA IS STANDING AND SPEAKING... OBAMA SAYS "GIVE HER SPACE", REFERENCES EMT, AND HANDS THE WATER BOTTLE EACH TIME!..." These clips are also available here. Thanks to Sonya for sending this to me. UK: "Smokers would have to get a licence to light up under the plan"
But smokers' rights group Forest described the idea as "outrageous", given how much tax smokers already pay. Professor Le Grand, a former adviser to ex-PM Tony Blair, said cash raised by the proposed scheme would go to the NHS. . . . . I will be on WGN in Chicago with John Williams at 2:07 CST (rescheduled for 10:15 AM CST tomorrow). I will be on Michael Graham show's on 96.9 WTKK in Boston at 5:20 EST. KMOX (again) 11:10 PM CST, or 12:10 AM Saturday EST. This morning I have already done stations such as KMOX and KGO. A cross the nation, the death toll on college campuses continues to climb. Virginia Tech, 21 wounded, 33 dead. Louisiana Tech, two dead. Northern Illinois University, at least 16 wounded, six dead. The travesty is, these deaths might have been prevented had students been allowed to carry firearms on campus. . . . The tragic shooting at Northern Illinois University late Thursday is another failure of the "gun free zone" mentality that has created a false sense of security on college campuses and other public venues across the country, the Citizens Committee for the Right to Keep and Bear Arms said today. "Gun-free zones have given us nothing but body counts," said CCRKBA Chairman Alan M. Gottlieb. "This giant loophole in public safety is becoming a national disgrace and it is time to dramatically change our perspective on self-defense in this country. . . . .
o An effective ban on all semiautomatic assault weapons. In addition, the Bush Administration should act immediately to better enforce the existing federal ban on the importation of foreign-made assault weapons. o A complete ban on high-capacity ammunition magazines that hold more than 10 rounds. o Ensure that all gun sales at gun shows are subject to a background check. This is a tough call, much tougher than most people think. Hillary needs to win Ohio, Pennsylvania and Texas. The polls for Ohio and Pennsylvania actually show Hillary with substantial double digit leads, though Ohio is getting a little tighter. The question is whether the Obama's recent wins will shake her support between now and those primaries. In addition, Karl Rove indicates that Obama may make significant inroads in Texas among Hispanics. I couldn't find any polls for Texas, and that is where things might really matter. Rove did mention that the really bizarre delegate counting rules in the Democratic primary in Texas and that heavily weights African-American votes relative to Hispanics. I guess that I am just assuming that Clinton knows more about what is happening in Texas. If she pulls in those three big states, I think that she will keep the majority she has of super delegates. Add to all that that Clinton will push for the large Democratic delegations from Florida and Michigan to be seated. If she pushes hard with legal action, it could really produce hard feelings among African-Americans. The more that it seems today that Obama is going to win, the more his supporters will be angry if she gets the nomination. It will be a bloody and difficult win, but the Clintons will do what they can and conditional on Texas, I give her the edge. All that said, I also think that Obama would be the easier candidate for Republicans to beat in the general. He is the most liberal member of the Senate, and his record will just be too much to defend. Take for example, his opposition to renewing FISA because it would allow us to spy on conversation where foreigners are talking to foreigners. I think that will be hard to explain to people. UPDATE: I have just come across a poll for Texas and it shows that Obama is in the lead. Obama is ahead 48 to 42 percent. "Hillary Clinton leads Barack Obama among self-described Democrats 47% to 42%. Obama leads Clinton among self-described independents and Republicans 24% to 71%." On the other hand, I wouldn't put too much weight on this right now. The main reason for this is that I am becoming more convinced that she will take Wisconsin. If so, I think that Clinton will take Texas along with Ohio and Pennsylvania. Obama will be edged out because of the super delegates and the seating of the Florida and Michigan delegations. UPDATE2: Several new polls give Clinton an average of a double digit lead in Texas. Last week when I traveled to California to give some talks, I briefly had the chance to visit the Reagan Library. The picture above is a Mustang that Reagan used while campaigning for governor in 1966. The library was a very beautiful place. It would be nice to have a chance to spend more time there in the future. Here is another picture of one of the many guns that Reagan owned. In the game, children use dog leashes, bungee cords wrapped around their necks or other means to temporarily cut blood flow to their head. The goal is a dreamlike, floating-in-space feeling when blood rushes back into the brain. . . .
DE KALB, Ill (CBS) ― Several people have been shot on the Northern Illinois University campus. The suspect killed himself and officials say the danger has passed. Officials confirmed that several people were shot at Cole Hall, a large lecture hall on campus, shortly after 3 p.m. and the campus was immediately placed on lockdown. Kishwaukee Hospital reported that up to 13 people were being brought to the hospital and that three to four of those victims had suffered head wounds. Student journalists at the school's Northern Television Center reported that there were 18 victims, two of them fatalities, including the gunman. 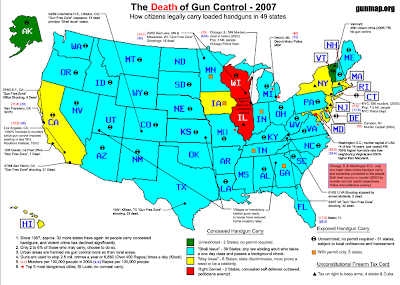 . . . .
Illinois is of course one of two states that completely ban people carrying concealed handguns anyplace. "Fully $200,000 of that [$226,000] increase [1989 and 2006] was the result of land-use regulations"! Sonya Jones sent me this link from the Washington State Supreme Court. The court reaffirmed the notion that people are allowed to defend themselves and their property from wild animals. [I]t may be justly said that one who kills an elk in defense of himself or his property, if such a killing was reasonably necessary for such purpose, is not guilty of violating the law. The only sad thing is that such a common sense ruling requires someone to go to court and fight the issue all the way up to the state Supreme Court. In this case, the guy engaged in "repeated requests" for help from the state and still had to go through this long court battle. Sonya Jones posted her own discussion of the decision posted here. Judge Charles Kahn, who was criticized in Allen's opinion, was described by his colleagues as acting, at times, "volatile," "irrational" and "schizoid." At one point, after Kahn signed up for a concealed weapons training class, the marshal in charge of court security testified that he put a lock on the door to the judges' robing room to stop Kahn from getting into a retirement party. . . .
For those interested, you can listen to my interview on Dennis Miller's show today here. An interview that I had with on the G. Gordon Liddy Show can be found here (the interview is about half way through the file). While summers in the UK became warmer in the period 1971 - 2003, there was no change in heat-related deaths, but annual cold-related mortality fell by 3% as winters became milder - so overall fewer people died as a result of extreme temperatures. . . . I have been watching some of the hearings, and what I found most striking was the difference between the Republicans and Democrats on the House panel. Republicans are defending Clemens, while the Democrats are going after him with everything they have. Republican Congressman Burton has just completely destroyed the former trainer, Brian McNamee, who was testifying against Clemens. McNamee claimed that there were times where conversations were said to have occurred that were just impossible, and the former trainer must have been caught in a what seemed like a dozen lies. The Republicans are fortunately standing up against the type of witch hunt that congress (particularly with the Democrats in charge) seems to special in getting into. I don't know whether Clemens is a Republican and that is the reason for the difference, but I would like to believe that there is something much deeper going on here. For those interested, here is a very interesting report on Clemens' performance over time. Art DeVany, who is an expert on these things, has some various thoughts on this case here and here. Despite the Obama momentum and recent landslides in many states, if Hillary were to win Texas, where there is a very large Hispanic vote, she would have won the four big electorate-rich states: New York, California, Florida, and Texas. That would be a strong case for many undecided Democratic superdelegates to support her notwithstanding Mr. Obama's strong showing. What happens in a deadlocked convention? If neither candidate throws in the towel and neither can get a majority of delegates, one option is a brokered convention, where both candidates step aside for a compromise candidate. That's the way smoke-filled, dealmaking conventions used to work. One name keeps resurfacing as the ideal brokered candidate: Al Gore. Many Democratic pundits still believe the Oscar and Nobel Peace Prize winner would have the best chances against the GOP in November. His record is not nearly as far left as Senator Clinton's or Senator Obama's and he may stand a better chance of winning independent voters than either of them. But a problem with this scenario, as one Democratic insider tells me, is that Al Gore and Hillary Clinton are "mortal enemies." She would rather sleep on a bed of coals than hand the nomination to her husband's vice president, whom she constantly squabbled with in the White House. . . . I will be on Liddy's Show today just after 12:30 PM EST. we will be talking about the DC gun ban case before the Supreme Court. I will be on Dennis Miller's Show tomorrow at 10:35 AM EST. For some places where the show airs delayed, that is during the first hour of the show. National Park Service currently forbids permitted Right-to-Carry guns in our national parks and wildlife refuges. Now 51 Senators have now written Interior Secretary Dirk Kempthorne to change the policy. 911 isn't always possible to call when you are camping in a national park, whether one is threatened by a bear or a criminal. Interestingly, Russ Feingold (D-WI) signed a letter even though Wisconsin is one of only two states that ban concealed handguns. The University of Iowa has a market where you can bid on the Democratic and Republican primaries and predict who will win. McCain has an almost 94 percent chance of winning, and Obama is over 70 percent. Personally, I think that given how left-wing Obama is he will be easier to defeat than most might think. Authorities have identified a man who was fatally shot while allegedly attempting to rob a man in a southeast Houston parking lot. Calvin Earl Taylor, 23, was shot several times by 36-year-old Keenan Procter, whom Taylor and Omari Duana Stephens, 24, allegedly attempted to rob in the 500 block of Gulfgate Center Mall Wednesday night. Taylor was pronounced dead at the scene. The incident occurred around 9:55 p.m. when Stephens and Taylor allegedly attempted to rob Procter in a parking lot, Houston police said. Procter, who has a valid concealed handgun permit, then fatally shot Taylor, authorities said. Procter was not injured. Stephens was charged with aggravated robbery and is currently in Harris County Jail in lieu of $30,000 bail. The shooting will be referred to a Harris County grand jury. I heard this rumor today, but it sounds pretty plausible to me. The filing date for the Arkansas Senate race is March 10th, and Huckabee seems virtually guaranteed of winning if he runs for the senate. I will be giving a talk tonight in NYC at 7 PM on Freedomnomics. For over seven years the Democratic Party has fulminated against the Electoral College system that gave George W. Bush the presidency over popular-vote winner Al Gore in 2000. But they have designed a Rube Goldberg nominating process that could easily produce a result much like the Electoral College result in 2000: a winner of the delegate count, and thus the nominee, over the candidate favored by a majority of the party's primary voters. Indeed, it has already been reported that Sen. Clinton will demand that the convention seat delegates from Michigan and Florida, two states whose delegates have been disqualified by the party for holding January primaries in defiance of party rules. The candidates agreed not to campaign in those states. But Sen. Clinton opted to keep her name on the Michigan primary ballot, and staged a primary-day victory visit to Florida, winning both of those unsanctioned primaries. Her campaign is arguing that the delegates she won in each state be recognized despite party rules and notwithstanding her commitment not to compete in those primaries. Of course. "Count every vote." . . .
My understanding from a well-placed friend is that the Hillary campaign is talking about actually bringing a lawsuit in Florida to force the delegates to be seated. The woman called 911 because her house was on fire and she was disabled. The operator put her on hold despite her pleading for them not to do that. The tape can be heard here and it is very graphic. In this case, the person was calling about a fire, but this could obviously occur with some calling about a crime.